Our featured artist, Robin Samiljan, is one of the new artists included in the Chicago Art Source Gallery Winter Show opening January 11 and closing on March 31, 2014. You’re relatively new to the FUSEDChicago group, how did you find out about us? I grew up in the Chicago area and moved to the suburbs of Boston shortly after marriage. I spent twenty-five years on the east coast, and when I decided to move back to Chicago I knew I wanted to seek out other artists working with encaustic. Fortunately, I discovered the FUSEDChicago group at the International Encaustic Conference in June 2009. I befriended several artists at the conference and reconnected with them once I moved to Chicago this past summer. In the fall, FUSEDChicago members Karen Tichey and Jenny Learner allowed me to participate with them in the group shows they were hosting, providing me with an introduction to the Chicago art scene. The organization has helped me find exhibition opportunities in the Midwest. 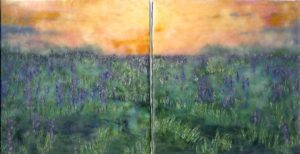 How did you get involved with encaustic painting? I discovered encaustic painting in 2008 when I went back to graduate school for a Master of Education degree in Arts and Learning. Being in graduate school mid life and specifically being in the graduate program at Endicott College forced me to try new things and open myself to being vulnerable in the studio. 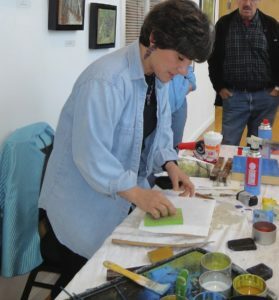 I had heard of encaustic painting because I was teaching watercolor painting at Montserrat College of Art, and at that time Joanne Mattera was using the college to host her International Encaustic Conference. After I spent time in my studio playing with beeswax and watercolor collage, I decided it was time to get serious, learn more, and I signed up for a post-conference workshop in 2009 with Tracey Spadafora. Her class was my official introduction to the medium and was the beginning of my love affair with encaustic. The following year I attended the full conference and also took a color theory class from Hylla Evans. I continued experimenting with encaustic and was drawn toward image transfers. I began to develop a unique style of encaustic mixed media work by combining photos I had taken, fusing these images into medium, then creating textures and greater depth with pigmented wax and oil pastels. Two years later I wanted to learn new encaustic techniques and I took a workshop from Laura Moriarty at Truro Center for the Arts at Castle Hill. I decided it was time to apply as an artist member to the Copley Society of Art in Boston, a long time professional goal of mine, and met with Kim Bernard to determine if I had a strong enough body of encaustic work. Kim helped me put together my portfolio and improve my website and resume. I became an artist member of the Copley Society a few months later and have been juried into most of the member shows ever since. Tell us about your process and inspiration. I’ve always been inspired by landscapes. Living in New England, I was able to visit the Green and White Mountains, rocky ocean coastlines and beautiful rolling meadows in the country. One of my artistic goals has always been to re-create visually the feelings I have from the places I have been. It is interesting that since I have moved to the city of Chicago my inspiration has shifted to urban settings, incredible architecture and cityscapes. How much time do you spend creating vs marketing your work? What marketing techniques work for you? I have always applied to local and national shows in order to develop my resume, I believe that is the only way to justify pricing for galleries. When I was teaching at Montserrat College I was asked to appear as a guest speaker at Salem State College to talk about the business of being an artist. The opportunities to exhibit and sell are everywhere if you make the effort, another reason joining FUSEDChicago was important to my relocation to Chicago. Do you have a favorite Chicago museum or gallery? My favorite childhood exhibit at the Art Institute was the Thorne Miniature Rooms. The incredible details confined into a small space took my breath away as a child. To this day, I still love visiting the exhibit. My miniature encaustic works (2.5” x 3.5”) are a direct result of my love for miniature details in a confined space. I will be one of the new artists included in the Chicago Art Source Gallery Winter Show opening January 11 – March 31, 2014. I also have work in “Winter Visions”, juried by Hope Turner and Zola Solamente of Arden Gallery in Boston at the Copley Society of Art this winter. My work can also be seen on my website and in my Etsy shop.